NLC President Comrade Ayuba Wabba said the strike would be inevitable if nothing happened before the set date. He appealed to workers across the nation to support the action to succeed in the interest of their social and economic prosperity. a speedy passage. He said: “It is unfortunate that the Federal Government is yet to transmit to the National Assembly an executive bill for the enactment of N30,000 as the new national minimum wage. “Government’s dilly-dallying on the issue has strained Government-Labour relations with a potential for a major national strike which could just be days away. “I want to appeal to the government to do the needful by urgently transmitting the bill on the new national minimum wage to the National Assembly. “We also would like to use this same opportunity to urge workers to fully mobilise for a prolonged national strike and enforce their right.” Explaining that the strike will become inevitable as the last option for labour, the NLC president called on all Nigerians and businesses to understand and support it. He however assured workers that their labour, patience and diligence would not be in vain. 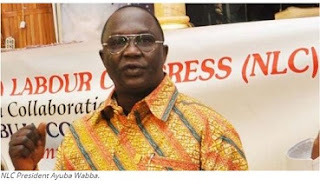 Wabba said the NLC leadership remains committed to giving all it takes to ensure workers get just and fair wages in a decent work environment appropriate to their well-being. He added that the NLC leadership is similarly committed to social protection for workers. “The new year presents great opportunities for workers, pensioners, civil society allies and their friends and families to put their numbers to good use. “This is by voting out, not on the basis of tribe or religion but purely policy, any candidate that cannot serve their interest. “In the year that is ahead of us, the NLC remains unequivocally committed to the national and workers’ goals which include the campaign for industrialisation, against selective enforcement of “No Work, No Pay” policy of government, among others,” he said.